The first blog post of 2012 should be of something special; Personally, I don't feel like making any of you bored with my lengthy grandmother story bout my reminiscence towards 2011, or the resolutions for 2012. The location of the day is an authentic Hakka restaurant around Bandar Puteri Puchong, which you would rarely notice because there are way too many food and beverages outlet around the town. Hakka Passion is a Non-Halal restaurant which serves Authentic home-style Hakka cooking, with air-conditioned ambience and Wi-Fi supported. I love the cozy, traditional ambience of the restaurant which gives me a warm feeling. This is non-Halal, and the pork tastes gorgeous when cooked with such an authentic Hakka style! The tofu is fresh and home-brewed. Very well-cooked. filled with red bean paste and topped with shredded coconut. This is gorgeous, and can rarely be found elsewhere! I just can't resist its awesomeness! The meal concludes on a sweet note with such a special dessert. P/S: Charges for the tea is RM 7 per table. When the bill comes... It costs around RM 30 per person for such authentic taste. don't hesitate to visit this restaurant! 1. Just fabulous; The food stuff served while hot is absolutely good. 2. The dessert was a total speechless and had my lip sealed with delight. 3. A fabulous way to start kick 2012! Anyway, HAPPY 2012 TO ALL! No. 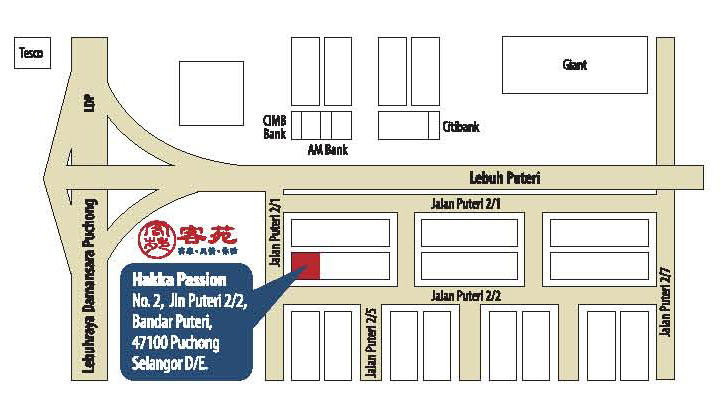 2, Jalan Puteri 2/2, Bandar Puteri, 47100 Puchong, Selangor. Must go and try else this Hakka Bananaz may have lost the hakka taste in future tQ. The Hong Qu Men Rou and the tofu look yummy! Mouth watering & nicely presented. I personally dont have any favourite Hakka dishes.. Cause I love food in general haha.. But I do love the 'lei cha'! nice writeup Fish!, your blog is getting better and better!! wow. i'm staying so near to puchong, and yet i didn't know there's such restaurant! the only hakka restaurant i know of is the ying ker lou, which has a lot of branches in major shopping complexes here. anyways ... i'm a vegetarian, so won't get the chance to try it out! hi Yi Han, glad to hear that you've visited this place before, i will put a "Like" for the foodstuff there too! hi Nikel, it tastes good too! hi Sean, well neither do i know bout hakka food too. i just happen to love it coz' i have not tried it before. Hello there, thank you for your comment and happy 2012 to you too! hi Hilda, i hate lei cha, lol, because it's way tooooo green to savour me. this is my first time of dining at such restaurant actually. hi Alien, then you should try it out and you'd definitely love it! happy 2012 to you too! hi Isaac, thank you for your compliment, and I'd learn more bout you too :) happy 2012! meow. ying ker lou is indeed very pricey. thanks for the review. RYC: my blog doesn't like non-nutang members to comment on my blog. that is why i have the dialogue box for readers to leave their comment. so pls leave ur comments there, as i update my blog frequently. sincerely apologise for my blog's misbehavior. happy new year. may all ur dreams and wishes come true in 2012. I must admit that Hakka food is not usual for us. I not familiar with the food except the famous Hakka Yong Tau Foo :) The food looks mouth-watering! Fish, it's great knowing u & I wish u all the best in 2012! yummeh! i am craving hakka food..until i have some, i can only read, see pics and drool. hi Merryn, the dessert is my favourite among all, and happy 2012 to you and family too! hi Shirley, that's exactly what im thinking too! thank you for your precious comments throughout the month and happy 2012 to you too! hi Kian Fai, drooling over the dessert eh? it is indeed very special and i'd love to taste it again. Hai Fish!! Long time no see.. Ha ha ha.. I was back in Sabah like for 2 weeks and now already back in KL.. And yeah, you make my day with these beautiful meals of Hakka, which I love their Looks!! And yeah, for sure, their taste was damn good!! ^_^.v.. Happy New Year Fish!! rm30 per person is quite worth. the purple colour desserts look promising. The dessert looks really yummy. I love the glutinuous rice cake filled with red bean paste and topped with shredded coconut. It looks so unique and beautiful. Hakka foods always very oily one but I like it very much. Hehehe! I think I been here before. The place looks comfy and clean. wow.. will try this one time when I am near Puchong.. I never like to go that area due to the heavy traffic.. but if I do go, I am sure I will go this place for makan too..
hi Sleeper, that's my topic! LOL. hi Tony, thats personal opinion, recently started in 2012 :) the amount of foodstuff is not that much because it was meant for a meal of two.